In the last two columns, I’ve highlighted two of my legislative proposals for this session, LB 205 – Adopt the Surgical Technologist Registration Act and LB 720 – Adopt the ImagiNE Nebraska Act. This week, I’d like to introduce you to another important piece of legislation that I have introduced that seeks to increase greater access to medical care, LB 29, an expansion of Nebraska’s telehealth statutes. Last year I introduced LB 701, a bill that would allow physicians and physician assistants to establish a patient-provider relationship via telehealth. This year, after working with the Nebraska Hospital Association, I introduced legislation to allow for other health care professions to establish those same relationships through telehealth. Through LB 29, I have sought to expand permissions for athletic trainers, clinical nurse practitioners, mental health practitioners, occupational therapists, optometrists, pharmacists, physical therapists, psychologists, and others. Telehealth services are growing rapidly in the United States and can provide access to care for individuals who live far away from health care services, and can also provide access for those who are unable to seek care outside of their home or a local healthcare center. Providers may also be able to handle larger patient volumes more efficiently by using telehealth due to decreased time for traveling and other tasks involved in a face to face visit which also has a positive impact on the cost of care. The hearing on LB 29 was held in the Health and Human Services Committee on February 6. Following my introduction, the committee heard from ten testifiers from the affected industries who all spoke in support of the legislation. We heard testimony from the Nebraska State Athletic Trainers Association, Children’s Hospital, the Nebraska Nurse Practitioners, the Nebraska Hospital Association, the Arc of Nebraska, the Nebraska Pharmacists Association, and the Nebraska State Board of Athletic Trainers, all of whom agreed that by enacting this legislation, health care providers would be able to provide greater access to health care for the citizens of Nebraska. To highlight how telehealth provides greater health care access, Children’s Hospital stated that in 2018 alone, their practitioners conducted approximately 1,800 telehealth visits. I look forward to working further with the members of the Health and Human Services Committee to advance this important piece of legislation to the floor of the Legislature to allow the Legislature to adopt this proposal into law. I’d also like to bring your attention to an exciting event being hosted by the Engler Agribusiness Entrepreneurship Program at the University of Nebraska – Lincoln and other local partners. On April 5 and 6, the program will be presenting the Heartland Shark Tank, which will have a number events included and is being highlighted as an Open Casting Call for ABC’s Shark Tank. You may find additional information and a more details of the events during the program at www.heartlandsharktank.com. As always, if we can be of assistance to you in any way, please do not hesitate to contact my office. My door is open and I have made it a goal to be accessible to the constituents of our district. Please stop by any time. My e-mail address is mkolterman@leg.ne.gov, and the office phone number is 402-471-2756. Tyler and Katie are always available to assist you with your needs. If I am not immediately available, please do not hesitate to work with them to address any issues that you may need assistance. Please continue to follow me on Facebook at Kolterman for Legislature and on Twitter at @KoltermanforLegislature. In last week’s column, I highlighted one of my priority bills for this upcoming session, LB 205 – Adopt the Surgical Technologist Registration Act. Today, I want to bring your attention to another major priority of mine and of my colleagues. As you may know, the Nebraska Advantage Act, the State’s largest economic incentive program, is set to expire in 2020. If we allow the Nebraska Advantage Act to expire without a replacement, Nebraska will be the only state in the nation without a comprehensive economic development package to create higher paying jobs and to provide for more investment from companies within and outside of the state. Before the legislative session began, representatives from the Nebraska Chamber of Commerce, Omaha Chamber of Commerce, and the Lincoln Chamber of Commerce approached me to introduce what would become LB 720 – Adopt the ImagiNE Nebraska Act. I happily accepted the opportunity to carry this critical piece of legislation. LB 720 will increase the value of the incentive program to the Nebraska tax payer through better investments, better jobs, more robust reporting and more overall transparency. LB 720 will accelerate the value of the tax credit by simplifying the process, will increase the competitiveness of the program by increasing the Net Present Value of tax credits, thus helping Nebraska to win more projects and other opportunities for our state. LB 720 will allow the State to build stronger relationships with businesses in order to encourage greater levels of investment and will allow the Department of Economic Development to better understand the needs of businesses and the evolution of business thinking in real time. LB 720 is a critical piece of legislation. I am very passionate in finding ways to lower Nebraska’s already high tax burden. If we cannot provide a competitive package to attract businesses to invest or to even relocate to Nebraska, there will be no money available for any type of tax relief and there will be less money for education. If we, as a state, do not provide business incentives I believe we will hurt the opportunities of our children and our grandchildren. Due to the national and global competition for talent and well-paying jobs, hard times will fall upon this state if we do not find ways to grow our population and diversify the State’s economy. While I introduced the legislation, I am not alone in this effort. I am honored that 22 of my colleagues from all corners of the state and of all political persuasions have cosponsored LB 720 to ensure our state’s economic future in this ever changing global environment. Having incentives to help grow our tax base is critical for our children’s future, for tax relief, and for job opportunities down the road. As the first week of legislative committee hearings draw to an end, I’d like to highlight one of the bills I introduced in front of the Health and Human Services Committee. On Wednesday, January 23, I had the pleasure of introducing LB 205 – Adopt the Surgical Technologist Registration Act. For background, surgical technologists are a critical part of every surgical team and are trained in setting up sterile environments and the preparing of the equipment and surgical instruments. During surgery, a surgical technologist takes direction from the surgeon on handling instruments, holding retractors and suctioning wounds. While the surgical techs are an integral part of every single surgery, they are the only member of the surgical team not required to prove minimum competency standards, something I find unsettling. I believe there is a significant need for surgical technologists to be regulated by the state for the safety of our citizens, which has been recommended twice by the state Department of Health and Human Services. LB 205 establishes a first time registry under the Board of Medicine and Surgery for surgical technologists and provides for competency and education standards. If a surgical technologist graduates from an accredited program, all they need to do to register is to show their documentation and pay a nominal fee. LB 205 also allows for on the job training so individuals who do not have a college degree can become a surgical technologist as long as the individual is certified after successfully completing a competency assessment completed by a licensed health care professional. LB 205 has been brought to the Health and Human Services after about six years of discussions, negotiations, and compromises between many stakeholders, including physicians, hospitals, and the Department of Health and Human Services. LB 205 has the support of the Nebraska State Assembly of the Association of Surgical Technologists, the national Association of Surgical Technologists, the Nebraska Hospital Association, and the Nebraska Medical Association. I look forward to continue working with the Health and Human Services Committee, the Nebraska Legislature as a whole, the Department of Health and Human Services, and the Surgical Technologists in order to finally adopt this legislation in order to ensure greater patient care in this state. As we wind down the first full week of the new legislative session, senators are working vigorously to introduce bills before the Day 10 deadline this coming Wednesday. Senators can only introduce bills for the first ten days, and there are currently around 500 bills that have been introduced. At this time, I have introduced twenty five bills, many dealing with retirement issues, but they also include better access to health care for rural Nebraskans, insurance oversight, and patient safety. For more information regarding each bill, committee hearing date, and bill status can be found on the Unicameral’s website: www.nebraskalegislature.gov. As your representative for Legislative District 24, I continue to be very concerned about the high property taxes in our state. These property taxes impact all citizens who own property, from our retired senior citizens to our farmers and ranchers who rely on the land for their income. The economy in the State of Nebraska relies heavily on agriculture, and with the down turn in the farm economy, we need to work hard to find real and meaningful property tax relief. Governor Ricketts has brought three property tax relief measures for the Legislature to discuss. His budget provides for $51 million dollars in new, direct property tax relief through the Property Tax Credit Relief Fund each year, establishing a statutory floor of $275 million for the Property Tax Credit Relief Fund, and establishing a three percent camp on property taxes levied by local governments. As a new member on the Revenue Committee, I will work as diligently as I can to develop the best way, in partnership, to address the revenue challenges Nebraska faces. Most likely, the solution will involve further financial restraint, reliance on money from the cash reserves and tax reductions to help spur more growth in our local economy. On Tuesday, Governor Ricketts delivered his annual State of the State address. Governor Ricketts highlighted economic achievements for the State such as being the number one state for fiscal condition, the number two state in the union for cost of doing business and regulatory environment, the third highest wage growth since 2014, the fourth best workforce participation rate and the sixth lowest employment rate. I wish to highlight one more item from Governor Ricketts address. In explaining what his administration is doing in terms of value-added agriculture, he brought up the Schulz family of Seward County, a family which recently gained approval to raise chickens for Costco. I was honored to have three generations of the Schulz family join me for the State of the State address. Greetings and Happy New Year! I hope everyone was able to spend time with loved ones during the Christmas season. The 106th Legislative Session kicked off on Wednesday, January 9. This year we will conduct a 90-day session, also known as the long session, with the expected adjournment date in early June. There are many changes to the makeup of the legislative body. We welcome 13 new Senators in the freshman class, and 8 of the 14 Standing Committees will have new chairpersons leading the way. Senator Jim Scheer of Norfolk was re-elected as Speaker of the Legislature. Other notable chair races include Mike Groene of North Platte defeating Rick Kolowski of Omaha for chair of the Education Committee and Lou Ann Linehan of Elkhorn defeating Brett Lindstrom of Omaha for chair of the Revenue Committee. Other Chairmanships of note were John Stinner of Scottsbluff being re-elected as Appropriations Committee Chairman, Steve Lathrop of Omaha being elected as Judiciary Committee Chairman, and Matt Williams of Gothenberg being elected as Banking, Commerce and Insurance Committee Chairman. Without opposition, I was unanimously re-elected as chairman of the Retirement Committee. Moving forward in my role, I intend for the Retirement committee to continue its work in protecting the plans assets, responsibly managing taxpayer dollars via the State’s contribution to the plans, while fulfilling the promised return to our retirees. This year I will continue to serve on the Banking, Commerce, and Insurance Committee and I will be a new member of the Revenue Committee, a committee tasked with taxes and revenue. I am also excited to announce that I have been selected by my peers to serve on the Executive Board of the Legislature, which supervises all legislative services and employees. The Legislature faces many challenges this year, the greatest being a budget shortfall to the tune of roughly $95 million. Governor Pete Ricketts and the Legislature will have to work together in order to make difficult, yet appropriate funding cuts to balance the budget while maintaining the state’s statutory duties. The Legislature will examine tax reform while taking a close look at ways to relieve property tax burdens. I know taxes are an important issue to all Nebraskans and we will work diligently to find solutions to our tax challenges. In Nebraska, the first ten days of session is the only time Senators are allowed to introduce legislation. While I do not know all the bills that will be introduced at this time, I foresee that some of the bills and issues to garner attention this year are property tax reform, corrections reform, medical marijuana and the funding of Medicaid expansion. This year, I am excited to welcome Tyler Mahood to my team. Tyler will serve as my legislative aide, assisting me with legislation, constituent issues, and communications. Tyler comes to my office via Senator Merv Riepe’s office, where he served as committee clerk for the Health and Human Services Committee for the previous two years. We are excited to have Tyler as part of our team and I look forward to him getting to know the wonderful constituents of District #24.
holidays to discuss the upcoming session and discuss topics that we know will be priorities once the session begins. legislative body – something that happens every other year at the start of the biennium. With much of the body changing due to term limits – the dynamics are different this year and as state senators we are getting to know our incoming colleagues, their interests, and what areas they may be interested in working on as it relates to policy matters. As I have shared previously, I intend to run for re-election as the chair of the Retirement committee. Many senators have announced their intent to seek chairmanships as well and still others will announce in the coming weeks. members of the legislature, it can be challenging. With Thanksgiving approaching, I want to wish you all a wonderful Thanksgiving filled with family, good food, and joyful hearts. I’ve always enjoyed Thanksgiving as a time to reflect on the bounty that is before us as Nebraskans. Even in our hardest times, I see good in Nebraskans who support and care for their neighbors, and at this time of year, I encourage you to reflect on the many blessings we share. A blessed Thanksgiving to all! This week, the voters of the 24th District gave me the opportunity to continue my work in the Nebraska Legislature, and I am grateful and humbled. Thank you for the trust you have placed in me. Please be assured I will continue to work hard for you over the next four years. After being re-elected, I notified my colleagues that I am planning to seek re-election as the Chair of the Nebraska Retirement Systems Committee. I have been a member of the Retirement Committee since 2015 and served as Chair of the Retirement Committee since 2016. I am proud of Retirement Committee accomplishments and its oversight of the state-administered and other political subdivision public pension plans. In 2016 the state’s actuary conducted an Experience Study which was used to establish actuarial assumptions for the state-administered retirement plans. The Committee worked closely with the actuary and the Public Employees Retirement Board to enact statutory changes to reflect the new actuarial assumptions, which included lowering the investment assumption from 8% to 7.5% and updating mortality tables to more accurately reflect the fact that plan members are living longer. Even with these costly assumption changes, the state-administered retirement plans remain well-funded. Last year the funding status of the County Cash Balance Plan was 107%, State Cash Balance 104%, Judges 94%, School Plan 87%, and the Patrol Plan was 85%. The Judges, Patrol and School Plans earned an investment return of 8.5% this year, so I would expect to see funding levels increase when the valuation reports are released later this month. The Committee has continued its work on pension reform to reduce long-term funding obligations of the defined benefit plans. In 2017, the minimum retirement age was increased from age 55 to 60 with the enactment of the modified Rule of 85 for the School and Omaha School Employees Retirement (OSERS) plans. The actuary calculated that this single pension reform will save the School and OSERS plans approximately $100 million in funding obligations over the next 30 years. I believe my leadership skills and open-door policy have helped facilitate legislative accomplishments and the long-term sustainability of the public retirement plans. I continue to work closely with the Nebraska Investment Council, State Investment Officer, Nebraska Public Employees Systems, employee groups, the Governor’s office, Chief Justice and Attorney General to address funding, policy and potential litigation issues. We had a good turnout at my town hall meeting in Stromsburg with Nebraska Department of Transportation Director Kyle Schneweis. I know that he appreciated everyone in attendance who engaged in a thoughtful discussion about transportation issues, especially the expansion of U.S. Highway 81 to four lanes. There has been a lot of activity around the Capitol the last few weeks. Last Friday, I attended the Nebraska State Patrol 59th Basic Recruit Class graduation ceremony in the Capitol Rotunda. It was a pleasure joining with Governor Pete Ricketts, Secretary of State John Gale and State Patrol Superintendent Colonel John Bolduc to welcome the 14 new State Patrol officers in their service to our great State. Their dedication and hard work is an inspiration to their families, friends, and everyone who has taken part in their formative years in attendance. The ceremony was especially meaningful for me to watch as Lucas Gleisberg – a member of Suzanne’s extended family – received the R.J. Buchholz Physical Fitness Award. 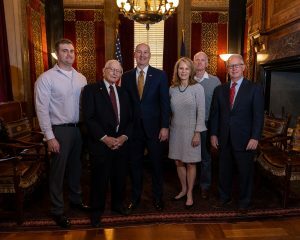 It is important to note that this was Secretary Gale’s last State Patrol swearing in, as he is not seeking reelection this year and will conclude his time in office in early January. It was mentioned during the ceremony that Secretary Gale has sworn in more than 300 Nebraska State Troopers during his 18 years in office. Also on Friday, I attended a special meeting with other senators to review Nebraska’s economic development programs. We reviewed research compiled by the Center for Regional Economic Competitiveness with the goal to enhance the Nebraska Advantage Act. I am hopeful that this will lead to meaningful policy changes that will help us as a State to overcome major challenges including outmigration of young talent, tight labor markets and infrastructure gaps including broadband access. I also had the opportunity to meet with representatives from several organizations as we prepare for the next Legislative session. A new one that I wanted to mention involves a collaborative effort called Invest in Nebraska. It is comprised of several of our State’s leading educational organizations including the Nebraska Department of Education, Nebraska Council of School Administrators, Nebraska Association of School Boards, Nebraska State Education Association, STANCE, Greater Nebraska Schools Association, Nebraska Rural Community Schools Association, Educational Service Units Coordinating Council, Beyond Bells, Holland Children’s Movement, Voices for Children in Nebraska, Stand for Schools and First Five Nebraska. They will be focusing on ways to ensure Nebraska schools provide a 21st century education for our young people. Since I have been receiving a lot of questions about the ballot initiative to expand Medicaid, I believe it is appropriate to provide some background information about the program. If you recall from a column I wrote a few weeks ago, Medicaid is already one of the largest State funded programs. For this fiscal year, Nebraska is already planning to spend almost $850 million or approximately 19% of the total general fund expenditures on Medicaid. In fact, the only program that receives more funding in Nebraska is the TEEOSA State Aid for schools. Currently, Nebraska’s Medicaid program provides assistance for individuals unable to afford necessary medical services. This includes the elderly, blind, disabled individuals and low-income pregnant women and parents with children. The program also includes the Children’s Health Insurance Program (CHIP), which provides medical assistance to children 18 years old and younger. As written, the ballot initiative would amend Nebraska’s Medicaid program to expand eligibility to cover certain adults ages 19 through 64 whose incomes are 138% of the federal poverty level or below. Expanding Medicaid would increase the income eligibility from $12,000 to $17,000 covering an estimated 90,000 additional Nebraskans who currently fall in this gap. Supporters of expanding Medicaid overstate the economic benefits without addressing the disadvantages. According to Nebraska’s Legislative Fiscal Office and the Department of Health and Human Services, expanding Medicaid would cost State taxpayers an additional $33 million during the next fiscal year and up to $768 million over the next decade. These additional costs would make it nearly impossible to provide meaningful property tax relief while potentially jeopardizing State aid to K-12 schools, the University of Nebraska and current Medicaid recipients – people with disabilities, the elderly, children and pregnant women – by reducing Medicaid reimbursement rates. It is important to note that in most states that have expanded Medicaid, the actual costs far exceeded the estimated costs. The Legislature has rejected the expansion of Medicaid over the last six sessions. I have always opposed the expansion of Medicaid, not because I am opposed to helping people, but we simply cannot afford it. I want to remind everyone that I will be hosting a special town hall meeting with Kyle Schneweis, Nebraska Department of Transportation (NDOT) Director. It will be from 1:00 to 2:00 PM on Thursday, October 25th, at the Stromsburg Senior Center (118 East 3rd Street). Director Schneweis will be joining me for a public discussion about NDOT’s Surface Transportation Program Book that was recently released for the Fiscal Years 2019 through 2024. This would be a good opportunity to ask questions about transportation projects proposed over the next one to five years. If you have had the opportunity to read my last few columns, I have been providing a brief overview Nebraska’s budget. This included information about revenues collected by the State and local governments. I also provided a general overview of State spending highlighting some of the larger government programs. Here is a link to my website, http://news.legislature.ne.gov/dist24/, in case you have missed reading these columns. The Legislature’s Revenue and Appropriations committees will be holding a special joint hearing next Friday, October 26th, to discuss the Nebraska Department of Revenue Tax Expenditure Report that is required by the Tax Expenditure Reporting Act. Tax expenditures are similar to government spending, except tax revenues are not collected by the State as a result of an exemption, deduction, exclusion, tax deferral, credit, or preferential rate in the tax structure providing an indirect subsidy for certain sectors of the economy. A biannual review is necessary to ensure that tax expenditures do not outlive their usefulness and adversely impact state revenues. You may view the report on the Nebraska Department of Revenue’s website at www.revenue.nebraska.gov. The Nebraska Economic Forecasting Advisory Board will also be meeting next Friday, October 26th. The nine member board meets every October and February to forecast state revenue collections including individual income, corporate income and sales taxes and other revenues. Both the Tax Expenditure Report and forecasting board revenue projections will be important to Members of the Legislature as we prepare for the next 90-day session that starts in January.